Legendary pianist Kenny Barron and a talented group of Brazilian musicians deliver a fine Brazilian jazz album. Describing just anybody as a legend could be a gargantuan overstatement. Reaching legendary status, particularly in musical circles, means that dues must be paid and that artistically, one has paved the way establishing themself as a true force to be reckoned with. Jazz pianist/composer Kenny Barron epitomizes that kind of legend status, considered to be among jazz’s greatest pianists. Kenny Barron & The Brazilian Knights once more allows the 70 year old to shine and impress with his immense skill. That said, this album goes further beyond Barron. It places him with some of the greatest Brazilian musicians of the times. While the Brazilian Knights aren’t necessarily well known everywhere, musically, their gifts radiate over the course of this fine jazz effort. Sergio Barrozo (bass) and Rafael Barata (drums) form a formidable rhythm section alongside Mr. Barron. Kenny Barron & The Brazilian Knights features three charts ("Rapaz de Ben", "Ilusão á Toa", and "Nós") composed by late Brazilian pianist/composer Johnny Alf, an early founder of Bossa Nova. Among the Alf compositions, "Rapaz de Ben" arguably packs the biggest punch, setting the tone of the album. Opening with a solid Latin groove, alto saxophonist Idriss Boudrioua carries the melody. Barron, as you'd expect, is a force behind the keys, regardless whether he plays a comping role behind Boudrioua’s lead or the role of an improvisational soloist. Perhaps the greatest highlight is when Boudrioua and Barron trade fours. "Ilusão á Toa" and "Nós" are also capable performances. "Ilusão á Toa" shows utmost musicianship via minute details, such as guitarist Lula Galvõa’s smooth transition from solo mode to a complementary role for Barron’s solo. By the arrival of "Nós" (track six), the ‘deck of cards’ of the anatomy of a Johnny Alf number has been both clearly revealed and well executed. Another vital voice to the success of this album is harmonica player and composer Mauricio Einhorn, who delivers four originals via "Já Era" ("It Was Before"), "Curta Metragem" ("Short Film"), "Tristeza de Nós Dois" ("Sadness of We Two"), and "São Conrado". "Já Era" introduces the unique, beautiful timbrel combination of harmonica and alto saxophone, an orchestration that continues throughout the course of the album. Breathtaking and attention worthy it is, Kenny Barron never finds himself overshadowed, delivering his complete bag of tricks encompassing comping, Latin piano cues, and of course his knack for awesome right hand soloing agility. "Curta Metragem" shows the range of possibilities of the harmonica at its best, something that remains awe-inspiring to this day in jazz, even post-Toots Thielemans. "Tristeza de nós Dois" conveys its message of sadness accordingly, showcasing truly disciplined restraint across all instruments. Even so, Barron breaks out on his impressive solo turn. "São Conrado" later concludes the album solidly. While Johnny Alf and Mauricio Einhorn account for seven compositions, Kenny Barron & The Brazilian Knights also features fine charts from Baden Powell, Tom Jobin, Alberto Chimelli, and Baron himself. "Só Por Amor" is the sole track to feature Claudio Roditi, who plays both flugelhorn and muted trumpet. The chart is an ambitious 11 minutes, but there’s plenty of stimulating musical ideas and flavors to absorb. Jobin’s "Triste" stands out, featuring only Barron and guitarist Galvõa. Both musicians understand their roles magnificently, oscillating between lead and accompaniment roles. Chimelli’s "Chorinho Carioca" serves as the penultimate cut, delivering a a short, but sweet, relatively quick cut. As for Barron’s sole original, "Sonia Braga", it is well worth the spins. Harmonically adventurous and gorgeous in sound, it ranks among the top echelon. 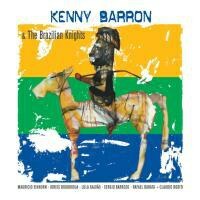 Ultimately, Kenny Barron & The Brazilian Knights is a superb Brazilian jazz album. It not only highlights Kenny Barron’s prodigious pianistic skills, but provides much deserved recognition to relatively unknown Brazilian musicians. While the effort is a lengthy regardless of standard or the deluxe digital edition, its reward easily outweighs ambitious duration. Musicianship throughout is exhibited at its loftiest.